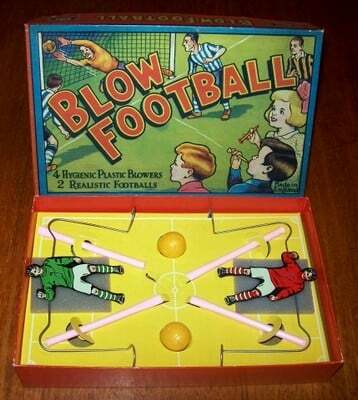 'BLOW FOOTBALL' GAME: Each player is provided with a blow tube and the players, having taken opposite sides, then try to blow the ball into the opponents' goal. Complete with four hygienic plastic blowers and two realistic footballs. The game is complete. But for the most minor storage wear at the edge of the box lid, the box and its contents can only be described as being in mint condition. In fact, the game does not look to have been used at all and we are confident that it never has; it even contains the original two sponges on which the tin-plate goalkeepers rest when stored. This game is in remarkable condition given that it is now over 60 years old.